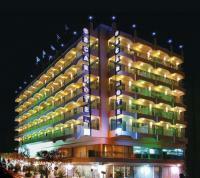 In an excellent position by the sandy beach in the bay of Gouves, about 17 kms from Heraklion and the airport, this hotel is well located for relaxing holidays by the sea, activity holidays with a range of facilities, or conferences. The 5-star Perle Resort Hotel & Health Spa Marine is an exclusive resort with beautiful views of the sea and great facilities. The Perle Resort stands 2 km from the beach which starred in the famous film "Zorba the Greek". Featuring stunning views of Fira's old port, the volcanic islets and Thirassia, Panorama Studios & Suites offers stylish and comfortable accommodation in a central location, with free wireless internet access. Situated in the heart of the capital's old Venetian town, the Arcadion is a contrasting combination of old and new existing side by side in harmony, enhanced by warm Corfiot hospitality. Copyright ©2010-2019 Hotels Online International Ltd. All rights reserved. A HOL-Canvas booking portal by Hotels Online.